You are here: Home / Obituaries / Charles K. Booda, Jr.
Charles K. Booda, Jr., 93, of Willow Valley Manor, formerly of Cherry Hill, NJ, died on December 7, 2017 at Arbor View of Willow Valley Communities, Lancaster, PA. He was born July 28, 1924 in the Lancaster General Hospital; the son of the late Charles K. Booda, Sr. and Isuphena Elicker Booda. He was predeceased by his brother Hugh M. Booda. Charles lived in Upper Darby, PA until he was 12. His family moved to Merion, PA where he graduated from Lower Merion High School in 1942. A veteran of WWII, Charles served 3 years with the U.S. Army in the 591st Field Artillery Bn., 106th Infantry Div. and fought in the Battle of the Bulge. Charles began working in the laboratories of Smith, Kline & French Pharmaceuticals. Later he accepted a position with the Campbell Soup Company finishing his 33 year career as Manager of Campbell’s Biological and Quality Assurance Laboratories. Charles and Betty lived in Cherry Hill, NJ for 31 years. During that time they were members of Bethel Baptist Church. Charles was a Deacon, he taught Adult Sunday School and he was Treasurer of Bethel Baptist Christian School. 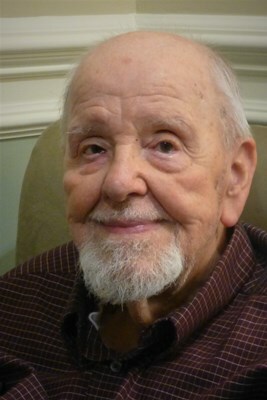 He was a life member of both the 106th Infantry Division Association and the Veterans of the Battle of the Bulge WWII. He served as Secretary of the Delaware Valley Chapter of the V.B.O.B. for several years. Charles was a train enthusiast and loved woodworking. Over the years, he carved a full size carousel horse and made a detailed doll house for his wife, Betty. He shared his interests with all his grandchildren who have many fond memories of time spent together. He is survived by his wife, Elizabeth Whetstone Booda of the Glen (formerly of Willow Valley Manor), a son, Charles K. Booda, III of Langhone, PA and two daughters, Elizabeth A. Hartzler of Greenville, MI and Eleanore G. Ralph of Westfield, NJ; 9 grandchildren and 12 great-grandchildren. Funeral Services and Interment will be determined and announced at a later date. Offer Condolence for the family of Charles K. Booda, Jr.
Eleanore, so sorry for your loss. Reading this obituary,your dad seemed to be a remarkable man and has left many memories. Our daughter is a recent graduate of his Alma mater. I hope all the wonderful memories will comfort you and your family through this difficult time..
Eleanor, our good thoughts and prayers are bcc with you and your family. Your Father was “The perfect Man” . He put the meaning of Gentle in Gentleman. He Served our Country for us to secure safety and was greatly Honored. 93 Years is a good life to have surrounded with the successes and growth of his Family. Mary Bones, your HS friend. I am Charles’s first cousin. My father was Lewis Elicker, Jr. After Charles retired, he would come to Harrisburg to visit relatives there and always stopped in to see me and my husband. Actually, I went to his wedding when I was in my teens. I am now living in New Hampshire in a retirement home. Your mother always sent me a Christmas card. You have my deepest sympathy. He lived a good long life and was a very nice man.